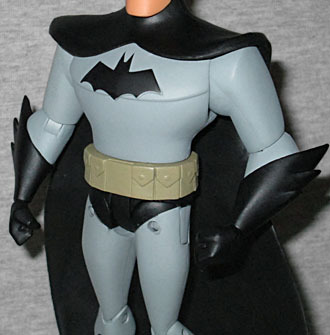 Both Kenner and Mattel had their chance to make Batman: The Animated Series toys, and neither of them really did a very good job. Now DC Direct gets to take a crack! 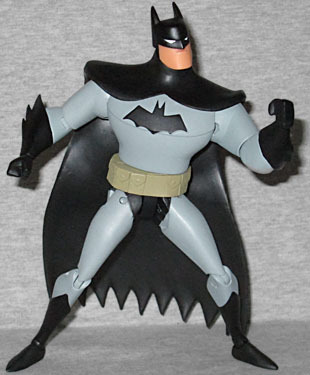 First, though, some terminology: this figure (like 75% of the figures in the first series, in point of fact) is based on the second version of Bruce Timm's character designs - the ones that coincided with the addition of "The New Batman Adventures" to the show's title. The art became sleeker and more stylized, setting the tone that DC cartoons would take for years afterward. But that doesn't make it a different show. A name change is not enough; in its second season, BtAS was given the subtitle "The Adventures of Batman & Robin"; does anyone consider that a separate show? New art is not enough; characters were redesigned between season one and two of Justice League; does anyone consider that a separate show? Do you want to buy the episodes these designs come from? They're sold as Season 4 of BtAS. What's my point? There's only one "NBA Batman," and it's this. The new design took what was already there and turned it up to 11. Or, turned it down to 6, I guess, since it has a lot fewer lines and shapes on it now. The sculpt is by Irene Matar, which isn't a name we've heard before, but we probably will hear again: this is spot on! The big wide chin, the way the lower lip juts out, the triangular eyes... perfect! The New Batman Adventures is when we could first start seeing (what we would eventually recognize as) "the Bruce Timm style" - the skinny, narrow ankles, the harsh curves where the shins and forearms dip in at the joint, before spreading back out for the thighs and biceps, the square shoulders, the chest that's twice as wide as the rest of the body, etc. All that stuff that we saw on countless generic JLU bodies is all done here, it's just done a lot better. Remember how all the JLU figures just had their details painted on? Well Batman gets a sculpted utility belt, and sculpted flares on his gloves. What's that you say? Mattel's version had the same thing? Okay, did Mattel's have a sculpted bat symbol on the chest? Did it have boots that are not just sculpted edges, but actual separate pieces on the end of the legs? No, it did not. Advantage: DC! And then there's the articulation. Do you even have to wonder if it's going to be superior? DCD beats Mattel so badly that if it were a second-rate rapper on Twitter, it would have teen girls promising to love it no matter how hard it hit them. [Too soon! --ed.] 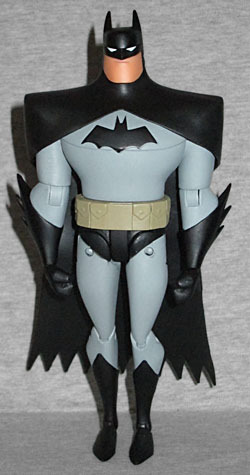 Batman has a balljointed neck, swivel/hinge shoulders, elbows and wrists, swivel waist, H-hips, hinged knees, swivel boots, and swivel/hinge rocker ankles. All the joints move freely, and none were stuck (which is something you need to worry about with this line, so be warned - as we review the other ones, we'll be talking a lot about broken joints). Despite his tiny feet and narrow stance, and a body that is generally the shape of an ice cream cone, Batman can stand by himself. You can stand him on his own little tootsies, and he'll stay that way (within reason, of course). But just because you can stand him by himself, it doesn't mean you have to. 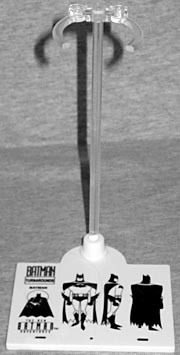 The figure includes a display stand, but it's a bit different than most action figures get: it's more like a doll stand, with a clear plastic rod and a clamp with two hinged arms to grip around his waist at whatever height you pose him. The base itself is just a flat white panel, but it's been printed with the official model sheet turnarounds from the cartoon. Clever! The base plate is a little more than 2" x 2½", and the post reaches 4¾" tall. If that's all this Batman came with, he'd still be pretty good. He's got a great sculpt and a bunch of good articulation. But the thing that pushes him into ToY contention is all the accessories. He has two capes: one falling in front of his shoulders, the other behind; both are pictured above. 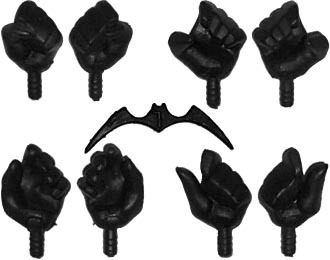 He has four pairs of hands: the fists he's wearing in the package, two gripping hands (with nothing to grip), two "relaxed" hands, and two hands designed to pinch a batarang. He also comes with a batarang. Additionally, you get the animated series' distinct grapnel launcher, and the end can actually be removed so you can play like he just fired it. Sadly, because of its unique design, he can't actually hold it in any of the included hands. Which must be why they included a ninth hand, with the grapnel gun molded as part of it! Outstanding! The end is removable on that one, too, so you really have to wonder why they include the loose one at all. 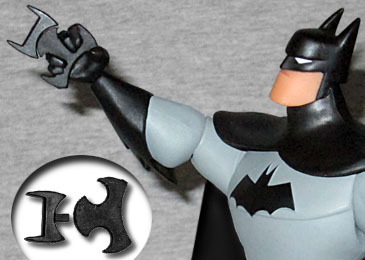 Whether or not it wins the ToY Award, DC Direct's Animated Batman is one of the best toys of 2014, and it's easily the best animated Batman toy there's ever been. If you were ever a fan of anything between Batman: The Animated Series and Justice League Unlimited (and come on, you know you were), you owe it to yourself to get this Batman.